When strawberries started to appear on the farmers’ market I had so many plans: to make pie, jam, crisp, and I could go on. So of course with so many ideas I bought many pints of strawberries and once I started to make jam I just couldn’t stop. I wanted to try out new combinations, add new flavours and jazz up the “old”, usual, classic strawberry jam. Well I am happy to report, not only I did that, but the friends and family members who tasted (and ate spoonfuls and even jars of) these jams all said these were stellar jams, and I had at least half a dozen requests to make more next year. So without further ado, here they are: I made strawberry jam with elderflower (since Boyfriend looves them), then some strawberry jam with rhubarb (since I love rhubarb’s tartness) and some strawberry jam with lavender (you guessed, once again inspired by someone who loves them: my best friend is crazy about anything with lavender)! All three are very different: the elderflower-strawberry jam tasted fresh, had a clean spring-like flavour; while the strawberry-rhubarb jam had a very characteristic tartness (that I just love savouring by the spoonful, enjoying as it prickles my tastebuds), and the lavender-strawberry jam had a fragrant, but not overpowering flower-y scent. Take your pick, or make them all, I’m sure everyone will find their favourite from the bunch! An extraordinary spin on the original strawberry jam: infuse your strawberries with the irresistible scent of elderflower and add a clean, fresh, spring-like taste to your sweet jam. Wash and hull the strawberries. If they are bigger, quarter them. In a bowl mix together the strawberries, sugar and lemon juice, then put the washed elderflowers on top, even push them so the flowers are immersed in strawberries and lemon juice, so they can infuse the berries with their scent and taste. Let sit for some time from 30 minutes up to 4 hours so the strawberries let their juices out. Once it has boiled, add the Gelfix and keep it on the heat until your jam is thick enough. 1. If you don't want to wait hours to let the strawberries and the elderflower sit to let out their juice, you can put everything in your pan and start boiling it straight away. I just suggest the wait time because it gives more time for the elderflower to infuse the strawberries with its scent. 2. I prefer my jam not to be too sweet and have the taste of fruit be dominant, but while cooking, taste the jam and if you find it not sweet enough add some more sugar. 3. I didn't blend the jam as I like to have bits of fruits in it, but if you prefer your jam to be of a more consistent thickness, then once your jam has reached the desired thickness take it off your stove (take out or leave the elderflowers, as you wish) and with an immersion blender blend until there are no more strawberry chunks. 4. I left the elderflowers in my jam, but depending on your preference you may take them out before pouring your jam in the jars. A twist on the classic strawberry jam: add in rhubarb for some delicious tartness. 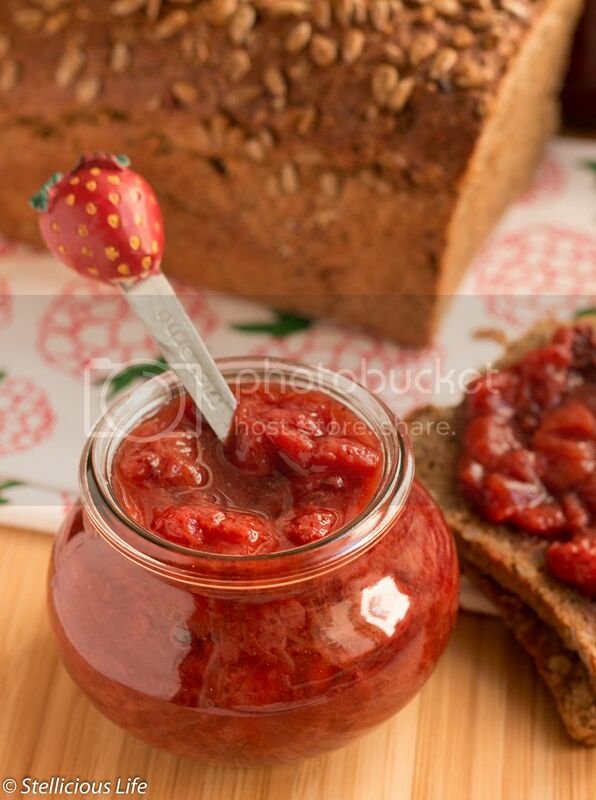 Perfect on toast (delicious for peanut butter & jelly), in tarts or even your breakfast yoghurt. Wash, peel if needed, and dice the rhubarb. In a saucepan mix together the strawberries and rhubarb pieces, the sugar, lemon juice and vanilla extract, and cook on low heat until the rhubarb softens. 1. I prefer my jam not to be too sweet and I especially love the tartness of rhubarb, but I urge you to taste your jam during the cooking and add more sugar or lemon juice, depending on your own preference. 2. I didn't blend the jam as I like to have bits of fruits in it, but if you prefer your jam to be of a more consistent thickness, then once your jam has reached the desired thickness take it off your stove and with an immersion blender blend until there are no more strawberry chunks (the rhubarb bits tend to fall into tiny pieces quite soon). 2. I didn't blend the jam as I like to have bits of fruits in it, but if you prefer your jam to be of a more consistent thickness, then once your jam has reached the desired thickness take it off your stove (take out or leave the lavender blossoms, as you wish) and with an immersion blender blend until there are no more strawberry chunks. 3. You can use fresh or dried lavender blossoms, fresh ones may release a more intense scent, so use them sparingly. So which one do you want to try? All three variations sound great, Stella! I especially love the elderflower idea. And strawberry-rhubarb is such an excellent combo, too! Oh I love this!! And I love elderflower!! I know, they have such a unique and fresh scent! Love these ideas…I can’t wait to try them! Oooo. I would go for the jam with elderflower! Or maybe lavender. I can’t decide! Thank you Helen! Aww, you live near a lavender farm, I’m jealous! 🙂 I love the scent of lavender! Have you tried having homemade lavender sugar or tea? Very simple and so unique.